ESA's X-ray space observatory is unique. 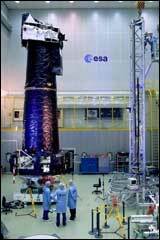 It is the biggest scientific satellite ever built in Europe, its telescope mirrors were amongst the most powerful ever developed in the world, and with its sensitive cameras it will see much more than any previous X-ray satellite. Design of the mechanical frames, PCB-layouts, production and test of the engineering models by APCON.